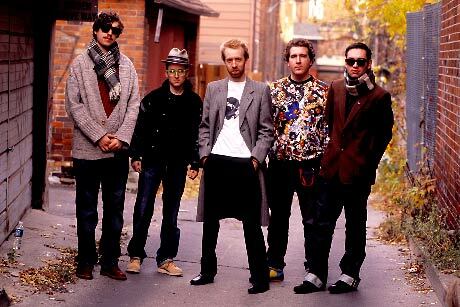 Formed on the playground in a chance wrestling match between visionaries Alexis Taylor and Joe Goddard, Hot Chip have become Elijah Woods favourite band. Last years debut album, Coming On Strong, was a unique meld of stylish indie pop, sizzling buttered soul and laidback funk. "Sexual Chocolate, taken from their Down With Prince EP, is one of their most adventurous moments, revving up a Neptunes-friendly beat to back their patented falsettos and subtle organ. However, when the chanting crowd steps in, the song takes a 180 into a Prince-style electric guitar riff complemented by some electronic weirdness that can only be described as a typical dip into the unpredictable world of Hot Chip. Hot Chip " Sexual Chocolate"